The games played in the City palace are very interesting and Elephant Polo is one among them. It is a very interesting game and the guests can also participate in it. It is exciting in a regal way. The mastery and dedication is shown by the trained players as it is a very slow game and it looks very impressive. Elephant Polo match is combined with a procession welcome, Attractive parade of decorated Camels, Lancers on the horseback and folk dancers. The guests will enter through the Tripolia gate which is Royal gate. For the Elephant polo, the guests are welcomed in a royal way with showering of rose petals, offering the garlands, tilak and melody of shahnai and nagaras. A drink is served to all the guests and then the elephant polo is started with an attractive parade of decorated camels. Elegant backdrop music is provided by the military band along with an attractive parade. 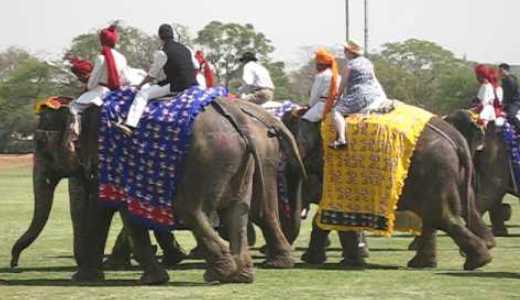 All the guests are provided with a Royal Elephant polo Broucher. Rules of the game are announced by the commentator and he also tells about the historic events associated with Elephant polo and the royal family. An autographed momento is awarded to all the guests after the match is over. Lunch ,dinner, hi-tea are also arranged for the guests. Horse Polo is a game which starts with welcoming of guests in a Royal way. This game includes a four horse lancers dressed in a traditional way with lances and Pennants and Military Pipers Band. Then there is band display which is done by Military Pipers Band followed by introduction of the horse polo teams which are escorted by the Pipers Band. After that the Ball rolls in and the horse polo match begins. This is a very special event in City Palace. Live commentary is also there during this event. To make the wedding ceremony in Royal ways many couples come here for their wedding. Getting married in City Palace recreates royal magnificence and provides regal experience which lasts forever. Caparisoned elephants, gaily-decorated horses and camels salute the guests at the Royal Entrance. Even the preparations of the Royal weddings start before the actual day scheduled for the wedding ceremony. There are even experts who can provide their valuable opinions upon the proceeding of the wedding ceremony. Getting married in City Palace recreates royal magnificence and provides regal experience which lasts forever. If regal is what you would expect for your wedding, make your wedding plan at City Palace in Jaipur. Caparisoned elephants, gaily-decorated horses and camels salute the guests at the Royal Entrance. As we all know that wedding have the lot of importance in our life, so couples spend lots of budget for creating their marriage the memorable one. Nowadays, City Palace in Pink City is one of the most famous places for Royal Wedding. Even the preparations of the Royal weddings start before the actual day scheduled for the wedding ceremony. There are even experts who can provide their valuable opinions upon the proceeding of the wedding ceremony. The wedding is full of color and amusement and is the time when all the members of the two families come together and get to know each other. Every couple dreams to celebrate their wedding in this traditional place. In Royal Weddings a couple can choose any way for their wedding style like Hindu wedding, Rajasthani wedding, Benagli wedding, Gujrati as well as other religions wedding. Events which take place during the wedding include Elephant Polo, which is very interesting game and the guests can also participate in this game. It also includes the decorated camel parades, folk dances and lancers on the horseback. The elegant backdrop music is also provided by the Military Band. These games are also followed by a lunch or dinner. The gracefully designed banquet halls that are provided by these forts and palaces are the main things that can make wedding a real memorable one.